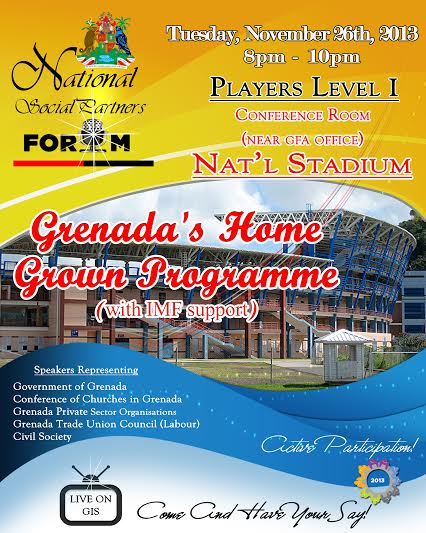 The Committee of Social Partners (CSP), as part of its public education series, will hold a panel discussion on Grenada’s Home Grown Programme with IMF Support, on Tuesday 26 November 2013, at the Grenada National Stadium Player’s Conference Room, Level I from 8:00 pm to 10:00 pm. · To build national support for the implementation of the Programme. Panelists will come from the Private Sector, Labour Unions, Churches, Non- Governmental Organisations (NGOs) and Government. The forum will be moderated by Senator Raymond Roberts, a member of the CSP. Persons viewing/listening to the live broadcast may submit their questions and comments to nationalsocialpartnersforum@gmail.com or to Facebook page Finance Grenada. – To forge consensus on how we, as a Nation, work together for Grenada’s economic revival and prosperity. The CSP urges the general public to participate in the series either by attending or tuning in to the live broadcast. The CSP is made up of representatives from Government, Business (Private Sector), Labour Unions, Churches and Non- Governmental Organisations (NGOs). It was established in March 2013 and is chaired by Prime Minister, Dr. the Rt. Hon. Keith Mitchell. The Committee meets every month.